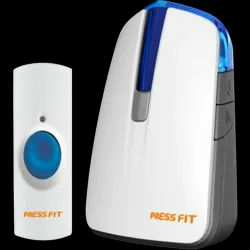 Press Fit - India's Leading Brand of Electrical Products - offers supreme reliability, high operating radius, attractive designs Echo Wireless Bells that are available in different remotes, different tunes, IP44 water-resistant remote and affordable in price. Press Fit Echo is a premium range of wireless bells. Wireless bells find their use in homes as conventional doorbells as well as distress alarms for the elderly. A wireless bell is the quintessential product used in every office as a calling bell for peons or as a counter bell in retail shops.